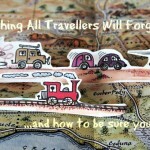 Do you write, draw or collect in your Travel Journal? 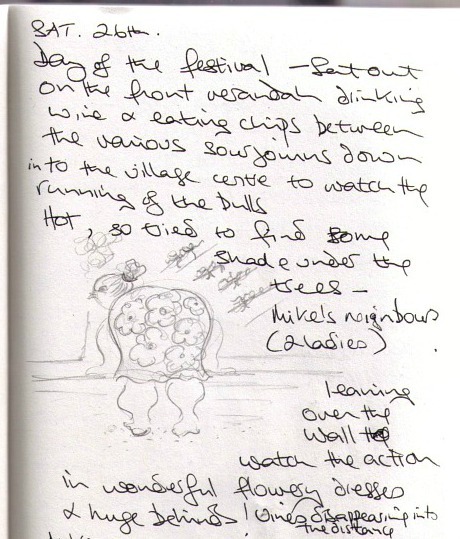 I’ve just unearthed some of my old travel journals during one of those sorting-clearing spring-cleaning sessions. 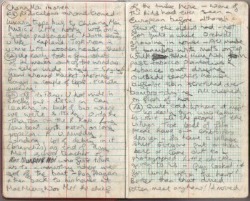 A travel journal from one of my earliest trips through south-east Asia, and another from a more recent visit to France have re-surfaced, which between them span many miles of travel over many years. Viewing them side by side the development of my journalling journey is clearly evident. That passing of time allowing for the exploration and discovery into how best to express and convey what I was experiencing then, for the fun of future reminiscing. 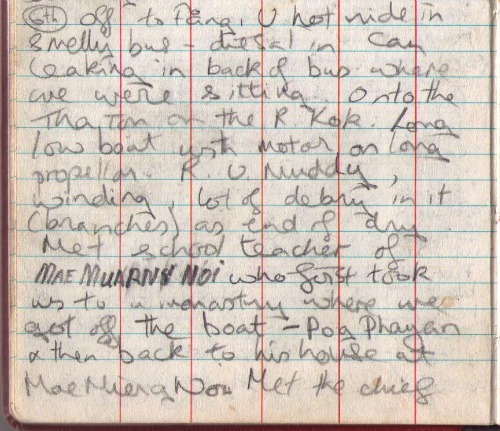 From one of my earliest journals on a trip overland from Australia to Europe the two-page spread above recalls, just in words, our venturing north of Chang Mai, Thailand to explore the Mae Kok River. We’d taken a bus up to Thaton on the Burmese/Laos borders and boarded a long low boat to take us down the Mae Kok River. Along the way we had got into a charade type conversation with a young male Thai who it developed was a teacher of the Thai language to the hill tribes in the region. He offered to take us to the village he had just been assigned to teach, and as it turned out we spent the night in what was to be his first night too in a new house they had constructed for him from bamboo. 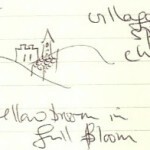 I asked him to write the name of the village in my journal (as you can see above). While I obviously asked him to write it for me as I had no idea how to spell what he was saying, it’s a great trick getting other people to fill in the details of your trip as today, when I hold the journal in my hands, its an amazing feeling still having this connection with him through his handwriting! 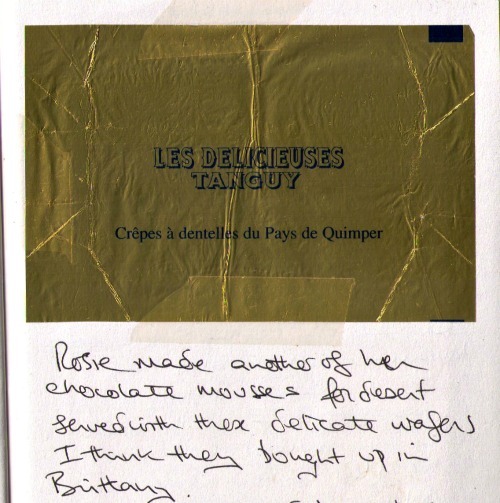 The extract below is from a travel journal I kept when visiting France in more recent times. A few doodle type sketches can help convey any scene so much better than words alone. I’m a believer of ‘its all in the detail’. It’s the little things that count and make the difference. It’s noticing how another culture goes about life that reveals and reflects the true country you’re visiting. The way they traditionally roof their houses. The colours selected to decorate their homes. The handmade lace decorating shelf fascias in the pantry. It’s all in the detail. I was going to say, and where words and drawings fail – but it’s not so much that words and drawings fail, it’s that they can be enhanced with actual snippets extracted from daily events. Such as a wafer wrapper as shown above, or a lowly leaf picked up on a woodland walk, below. 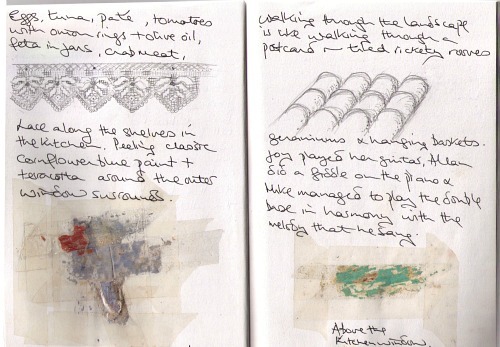 My first travel journal consisted entirely of just words, which over time I’ve learnt to supplement with images and artefacts. 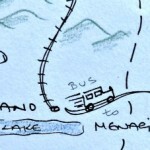 This entry was posted in Travel Memories and tagged how_to_journal, journalling, journalling_tips, travel_journal by Linda. Bookmark the permalink. What an interesting post, which is what journals are: interesting. I think this quote will have to be my my next pictorial blog post. Love it! I have to add to Oscar Wilde’s quote that a travel diary that’s been tucked away for a few years is an even more sensational read! What brilliant examples of your journalling, Linda. My immediate reaction was that I’m a word person, although I add photos and collectibles. However, looking at your sketches, I just might be ready to experiment with them – after all, as you said, it’s to bring back those precious memories. Brilliant post thanks Linda! I have been really encouraged by recent research on journalling and how it adds to our happiness, mindfulness and mental health. Your snippets are wonderful and I can see how they gave you joy at the time and so much more now! I am visual – but words rather than pictures -but after seeing your journal I am going to add pictures and samples in my journals in future. I recently found a perfect journal for my trip in September! As soon as I picked it up, I knew it was the one I’d been looking for. It’s the perfect size, and it’s soft purple leather cover gave me a feeling of decadence. Also, the cherry on the cake – I use the word “fabulous” a lot… and right on the front cover, embossed in the leather…. “Be Fabulous” — how could I resist! But I digress.. back to your question. I definately favour words, but a doodle or quick sketch goes a long way, and I like taping stubs and receipts in my travel journal too. Interesting to see your transition to plain vs lined. The combination of a journal in ‘purple’ and ‘leather’ really does sound fabulous! And do tell… Where are you going in September? Pingback: Are you an Aural, Visual or Kinaesthetic Person?